Bay Family Restaurant and Motel has home style cooking near Green Bay's Lambeau field. Open for breakfast lunch, and dinner this family and child/kid friendly restaurant offers quality food in a laid back atmosphere. They make homemade soups and desserts and have a large menu including a variety of breakfast items, salads, sandwiches, soups, and dinner entrees. 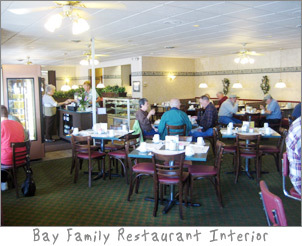 For lunch I went to eat at the Bay Family Restaurant & Motel, I was surprised at how large the inside of the restaurant is and how much seating capacity there is in the interior. There is the choice of sitting at the long counter, a booth, or a table. The interior is surrounded by large picture windows which makes it nice and bright. It has a casual and bustling atmosphere with ceiling fans, planter boxes with silk plants, and muted televisions placed throughout. In their display cases they sell quarts of homade soups, today the soups are chicken dumpling and chicken booyha, and there are also different bakery items for sale. It was very busy and the restaurant was filling up fast, but the staff was rushing around in an upbeat mood. Bay Family Restaurant has a huge menu which offers breakfast, lunch, dinner, and a large variety of cocktails, different beverages, and homemade dessert items. Also a nice plus is that they use non-hydrogenated cooking oil, a mixture of canola and corn oils with 0-transfat and low in saturated fats. I ordered a cup of coffee for $1.35 and was brought a full thermos of hot coffee at the table. 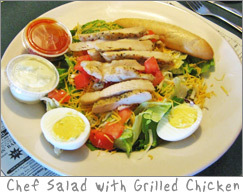 I then decided on the Chef Salad with grilled chicken for $7.50. My salad was large and consisted of fresh romaine lettuce with shredded cheddar and mozzarella cheeses, one hard boiled egg cut in half, chopped tomatoes and a warm bread stick on the side. My chicken breast was sliced and served warm on top of the salad, it was tasty and had a nice seasoned flavor of lemon pepper. 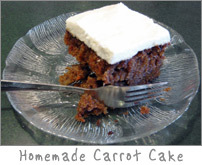 For dessert I ordered their homemade carrot cake with rich cream cheese frosting for $2.25. The frosting was thick and delicious, the cake was moist, sweet, and spicy - it was delicious. This is good home-style cooking and service at its best.